After breakfast we met our guide, Ashley, for the start of a four part whistle stop tour of Beijing. 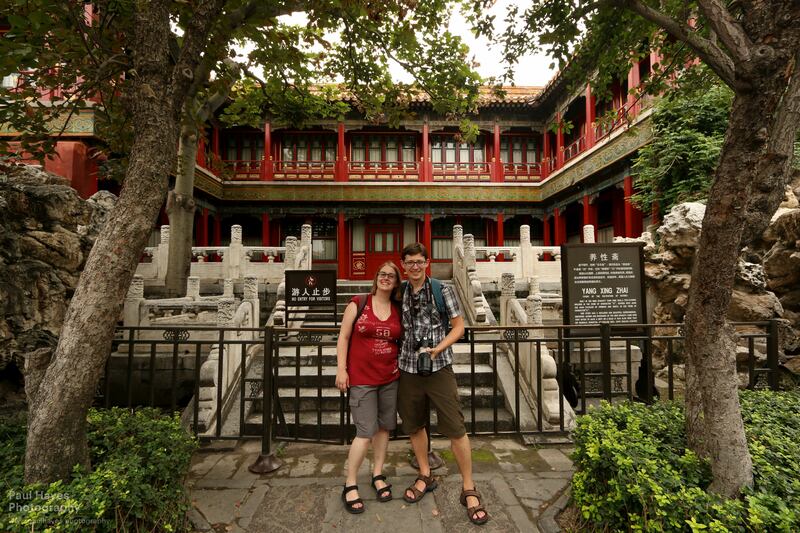 From our car, and after our first traffic jam of the morning, we visited Lama temple. Lama temple (or Yonghe temple) is “the most renowned Tibetan Buddhist temple outside of Tibet”, says the Lonely Planet. To our eyes it seemed very similar to the Buddhist temples we’d seen in Vietnam, particularly those in Hue. A tree lined road leads up to the temple, and at the entrance there’s a burning altar where people burnt incense and said prayers. The sky was a bright white, without any defining features, Beijing’s infamous smog perhaps? Large green persimmon hung from trees dotted about the courtyards. The temple is made up of five halls, which appear to be in rows, each row separated with a courtyard. 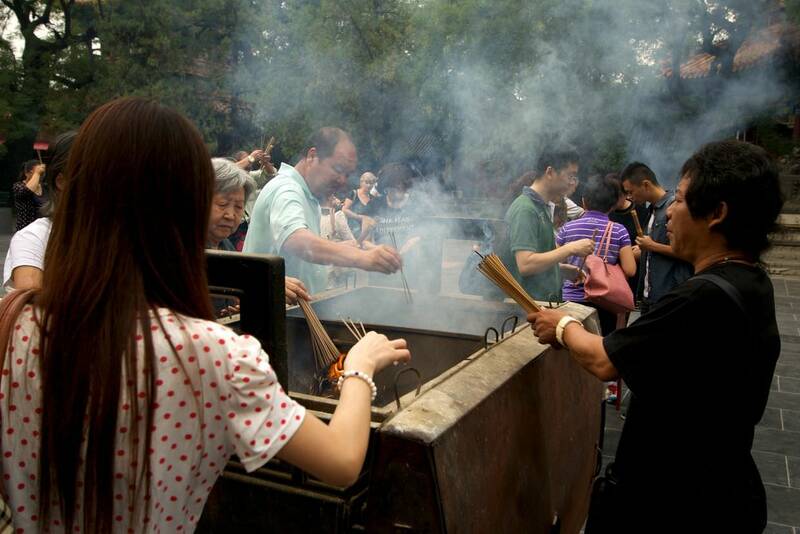 For Beijing’s city centre, and with the number of people there, it was quiet. As we passed through each of the halls, from the Hall of the Heavenly Kings, to the Hall of Harmony and Peace, and so on, Ashley taught us about the poses and ranks of the different Buddhist statues we could see. Still a little jet-lagged, or mostly just tired, we didn’t take much of it in. At the far end of the temple complex lies the Pavilion of Ten Thousand Happinesses, which holds an enormous 18m high standing Buddha, resplendent in gold and carved from a single piece of Sandalwood. We exited via a small door in the temple wall, which opens up onto a busy highway and a car park filled with coaches. 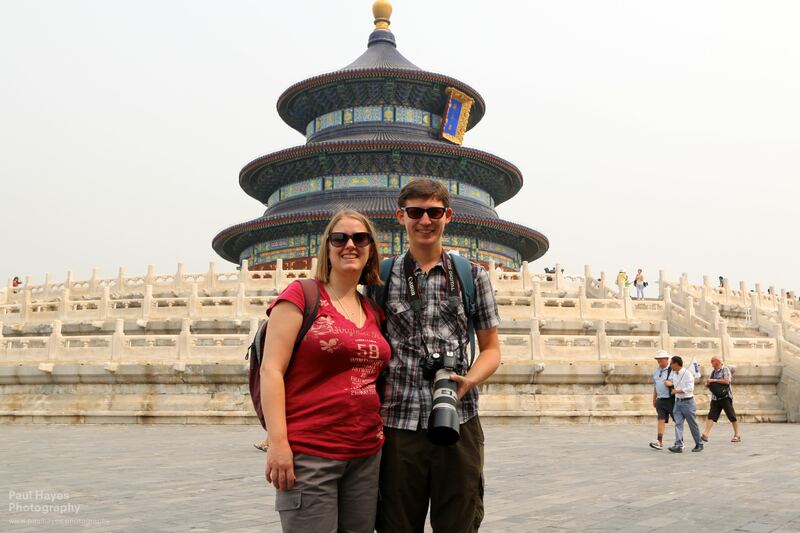 Our driver was waiting, and we clambered in and sped off to our next stop, the Temple of Heaven. What should have been a short trip took 45mins; the mid-morning traffic was busiest by a hospital, where we overtook an ambulance with its lights flashing. Sam took the opportunity to have a quick nap, and when we arrived we had to wake her up. The Temple of Heaven (Tiāntán, 天坛) is predominantly an extensive park containing some important religious structures, namely the iconic Hall of Prayer for Good Harvests. With Ashley we ambled through the park’s perfectly manicured paths and a menagerie of activity groups. In the discordant park, where the loudspeakers blast out tinny songs at volumes they can’t cope with (to drown out the neighbouring music), we passed by choir groups, dance troupes, tai chi martial artists with plastic swords — and (tai) chi ball players too. 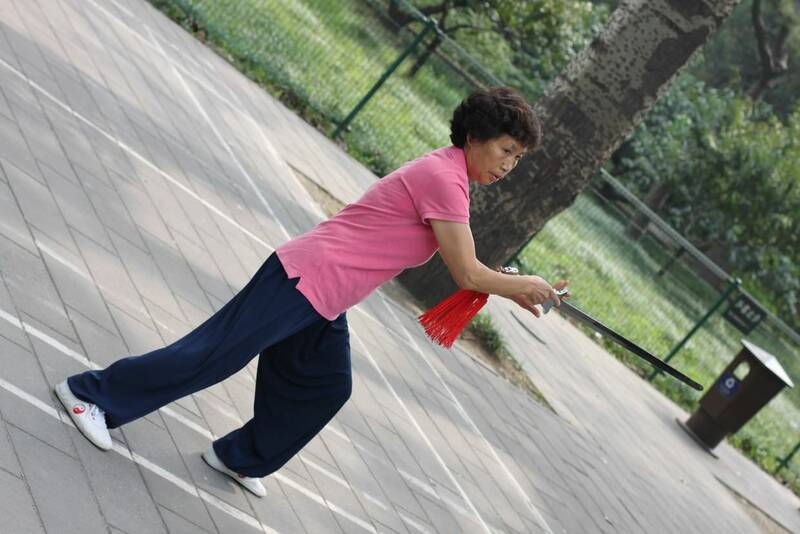 The paved areas are filled with these groups, formed mostly of Beijing’s healthy retirees, enjoying the outdoors — it’s free for them to enter. In this cacophony Chinese magpies flitted about the grounds and black squirrels scurried about the grass, which you cannot walk on. The park was similar to all the city parks (often People’s parks) we found in China; the paths, plants and grass all look perfect. The paths and courtyards are filled with groups partaking in dance and martial arts — at all times of the day. And walking on the luscious green grass is always expressly forbidden. From the park we climbed white-stone steps up to the Hall of Prayer for Good Harvests. Ashley explained that traditionally the emperor would come here and, you guessed it, pray for good harvests. Some of the emperors duties could be shirked off to other high ranking officials, but this act always had to be performed by the emperor. The hall is a unique “triple-gabled” wooden structure, rebuilt in 1889 after being struck by lightning (I wonder if the harvests were good that year). Around the hall we spotted at least three couples having their wedding photos taken; in Shanghai the brides had been dressed all in white, but here the dresses were red or turquoise and were “traditional with a modern twist”, Ashley pointed out. You can’t enter the building, but climbing to the top does give you a view out across smoggy Beijing. The park here had ripe persimmon too, so ripe that they were falling from the trees almost rotten, squishing on the concrete in a big mush. And as we exited, right by the car park, one fell and narrowly missed a child, everyone jumped in surprise as the orange pulp splashed everywhere. We told Ashley that we’d like to try some traditional local food for lunch, and she took us to a restaurant on the South East corner of Tiananmen square. The picture shows the name of the place, but I can’t translate it. The place specialised in hot pot, and it was busy. On a table for three we chose some fairly safe options — stir fried beef and onions, fried chicken and cashews, and mushrooms with pak choi (the menu had pictures, and included a lot of things we wouldn’t dream of eating — offal soup, tripe). 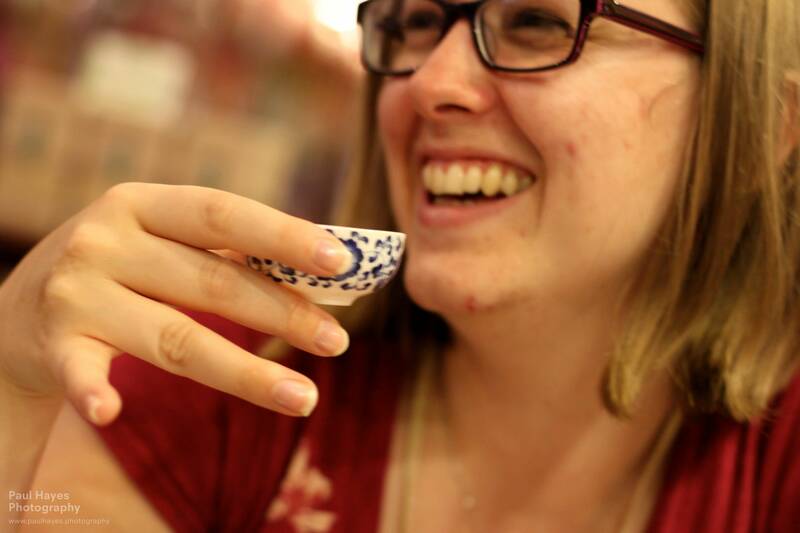 Sam also ordered a pot of yellow chrysanthemum tea which we split between three of us — Ashley instructed us to point the teapot’s spout away from everyone, and showed us how to hold the cups. Directly over the road from the restaurant was the square, it was nice that our car journeys were over, from hereon we’d be walking everywhere. To enter the square you pass through a security checkpoint with metal detectors, ID checks and even explosion proof bins for bombs. It was a little eerie being here, just the name of the place evokes that image. Tiananmen square (Tiān’ānmén Guǎngchǎng, 天安门广场) is vast and formidable, my memories of the place feel cold. 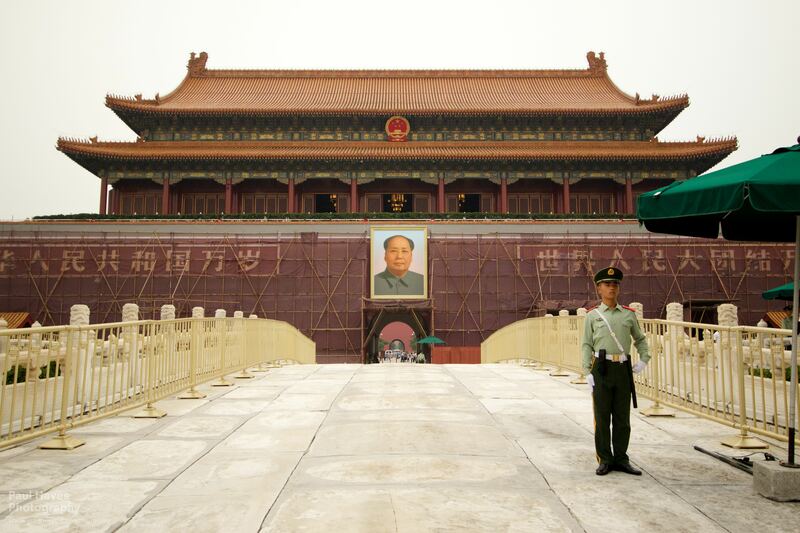 Mao’s mausoleum sits at the south entrance of the square, but is closed in the afternoon. By coming here now we’d avoided a lot of the Chinese tour groups who start at the mausoleum; they’d all been and gone. On either side of the square are two large and imposing buildings, the National Museum of China and The Great Hall of the People; both white-bricked and Soviet-like. 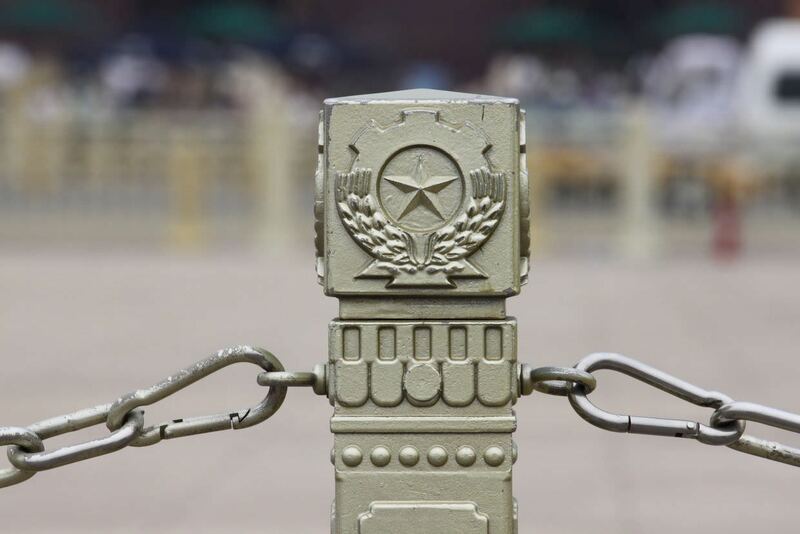 At the North is the Gate of Heavenly Peace leading to the Forbidden City, which adorns the famous portrait of Chairman Mao. While we were there the gate was being decorated and prepared for a special flag raising ceremony for the 65th anniversary of modern China — at the start of October. 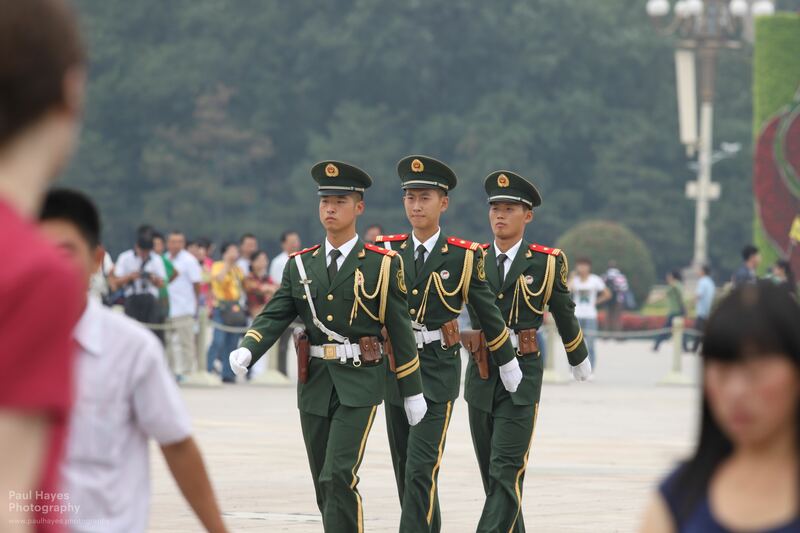 Our timing meant we also got to see a changing of the guard at the national flag pole, where three green-uniformed members of the People’s Liberation Army marched across the square, exchanged salutes and stood at their new posts. From the flag pole we passed through the subway to the gate of heavenly peace, out of the square and onwards to the Forbidden City. 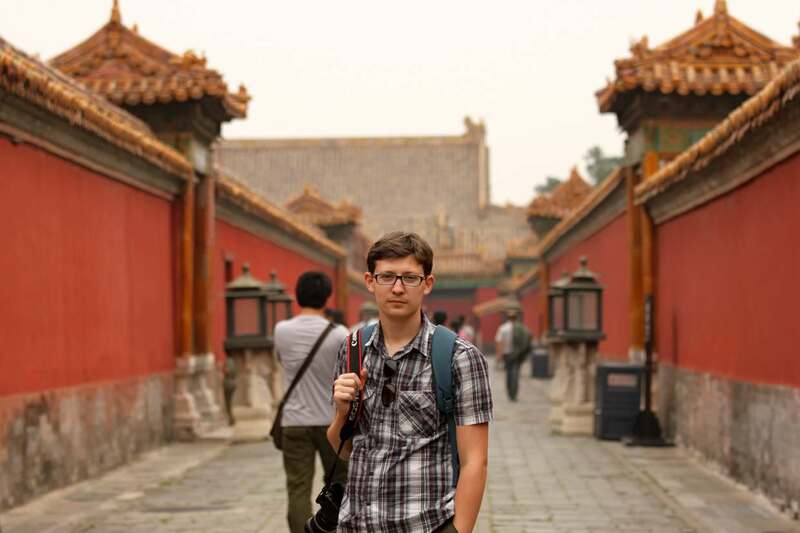 You can’t come to Beijing, or even China, and not visit the Forbidden City; that’s what we’d heard. Naturally I was anxious to see the place, and expectations were pretty high. It is the largest palace complex in the world, is surrounded by a moat, contains a city within a city and was preserved for 500 years by virtues of being off limits — intruders were executed. Entrance is through the Meridian Gate from the south. Like we’d seen at the Imperial City in Hue, the central arch (of five) — as well as the following paths and steps, were reserved exclusively for the emperor. Servants and officials had to use the side entrances. It was under renovation but its red walls already glowed after a recent repaint in 2008, for the olympics. From the gate we entered the first courtyard, which is traversed by the Golden Stream and five marble bridges, leading up to the Gate of Supreme Harmony. In these outer areas of the city the emperor conducted the running of the country, we were told. The buildings themselves are now, disappointingly, empty — their lavish furnishings presumably stripped bare when foreign forces arrived in the 20th century. 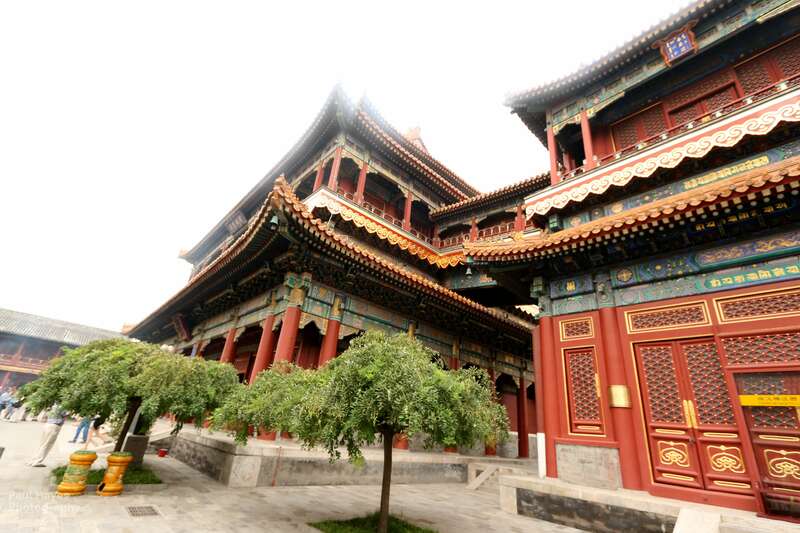 But the buildings themselves are still decadent; 11 golden dragons perch on each corner of the rooftop, bronze lions guard the entrances, and bright red pillars are topped with ornate gold and green motifs. Next comes the most impressive building of all, The Hall of Supreme Harmony, which lies at the centre of the Forbidden City. 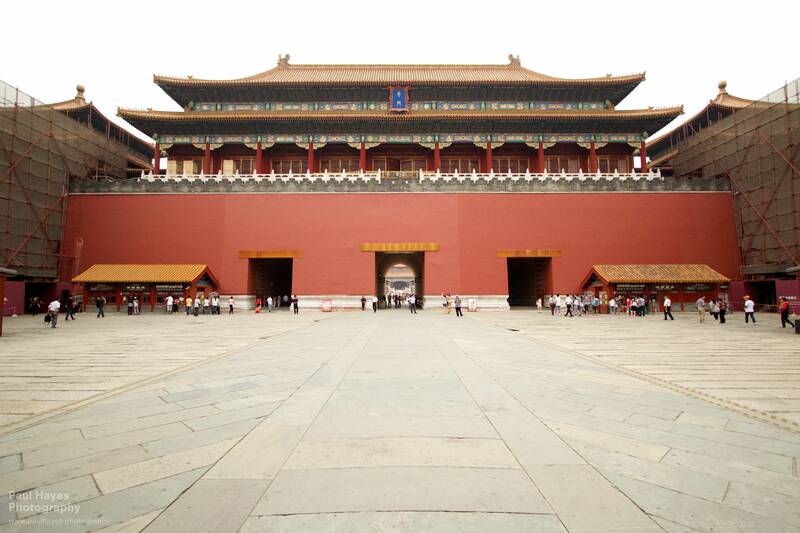 Its built on three levels of marble and is the largest wooden structure in China. Crowds push and shove to peek through the entrance and get a glimpse of the emperor’s old throne. Its closely followed by the Hall of Middle Harmony and Hall of Preserving Harmony. Beyond the grand halls and courtyards lies the city within a city — the inner court, a network of red walled roads connect the emperors’ former residences, bridal chambers, living quarters for the palace’s harem and even an Imperial Garden — a perfectly landscaped Chinese garden with pruned shrubs, trees and rockeries (or “perilous rocks” as the signs said). This was our favourite part of the city, the buildings were smaller but were unique, had character and still showed signs of how they’d have been used. On our last legs, tired after quite the sightseeing experience, we exited the city through another ornate gate, the North gate. Ashley had promised us Chinese tea in the park, and right opposite the park’s exit is Jingshan park, a manmade hill looking over the city. Exhausted, Ashley directed us through Jingshan park (entrance 4¥; 40p) to a tea house, where she’d called ahead and made a booking. Somewhere we could sit down, relax and recuperate; but not before stumbling upon a tree with a signpost morbidly indicating that this was the location of an emperor’s suicide. It was where Chongzhen hung himself (after killing his sons) amidst a palace invasion and the fall of the Ming dynasty. Ashley said something about the tea house being for members only, but from the looks of the other patrons it seemed like a tourist-only kind of place. Nevertheless we sat down and enjoyed our first Chinese tea ceremony. We tried oolong (with a tall thin cup for smelling first), ginseng oolong, jasmine, pu-er, and red rose tea; and then flatly ignored the pressure to buy some of the fresh tea, which came in pots starting at 300RMB each (about £30). 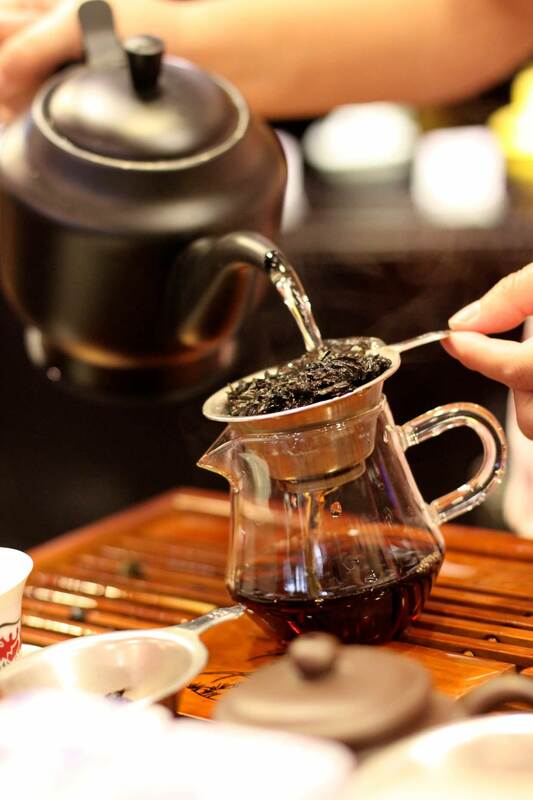 We’d already discovered that tea in China was expensive, often costing as much as a meal, but this was prohibitively so (we later found some much cheaper higher quality jasmine tea — refrigerated to keep it fresh no less — in Chengdu). Before leaving the park, on our tired legs we climbed to the top of Jingshan for the towering twilight views over Beijing and the Forbidden City — but the clouds and smog obscured much of it. Our city tour was over now and we said our farewells to Ashley (a good patient guide who’d spent longer with us than she needed to) and walked back to the Hutong (the scale of Beijing’s maps are hard to fathom — the streets are so wide, long and straight that at a glance most distances seem shorter than they are in reality — the walk back took a further 40 minutes). The pedometer reading for the day sits at 21,317 steps. 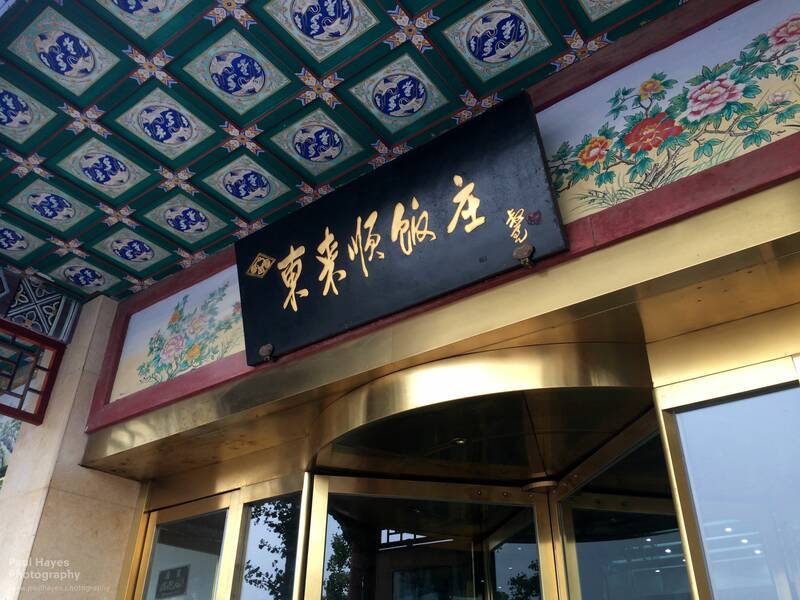 For dinner we fancied the highly recommended Dali Courtyard, specialists in Yunnan cuisine. It sounded intriguing, you don’t order from a menu you simply pay a price per head and eat courses until you’re full. You don’t choose the dishes, it’s whatever the chef fancies cooking. However, the courtyard itself was closed tonight — some function, the place was filled with people when we stopped by. But, a waiter directed us down the narrow alley to what is effectively Dali Courtyard 2, or Dali Su. We opened with some local rice wine, before I moved onto cheaper local beer and Sam had a Dali special (Chinese Baijiu, Mint, Lemon and Sprite). We stuck around for about 9 courses and after a while it starts to blur into one, so we took notes as we went, but for some dishes we hadn’t a clue to begin with. The opening courses were exquisite, the flavours were delightful — tempura lotus pods are amazing, the prawns brilliant, and although we aren’t usually fans of tofu — the first dish was lovely. Ultimately we hung around a little too long, the second tofu dish had a burnt taste to it and then an enormous plate of fish with bones came out just as we were full-up — it wasn’t quite right. We were hoping for some dessert, but we hadn’t yet learnt that the Chinese don’t do dessert.